1861 - During the Civil War, Seaman Benjamin Swearer lands with troops from the steam sloop of war, Pawnee, and takes part in the capture of Fort Clark, at Hatteras Inlet, N.C. He serves throughout the action and has the honor of being the first man to raise the flag on the captured fort. For his gallant service throughout the action, he was awarded the Medal of Honor. 1862 - The gunboat, USS Pittsburgh, supports Army troops landing at Eunice, Ark., during the Civil War. 1915 - After pontoons are brought to Hawaii from the west coast, and following extensive additional diving work, the submarine USS F-4 is raised from the bottom and taken into Honolulu Harbor for dry docking. Previously, in March 1915, during a routine dive a few miles off Honolulu, F-4 sinks in 51 fathoms of water, with the loss of her 21 crewmembers. 1916 - High waves force armored cruiser USS Memphis aground at Santo Domingo, Dominican Republic, killing 33 men. Lt. Claud A. Jones rescues crewmen from the dying ship's steam-filled engineering spaces. Years later, in Aug. 1932, Jones receives the Medal of Honor for his actions. 1944 - USS Jack (SS 259) attacks Japanese convoy H3 and sinks minesweeper W28 and army cargo ship, Mexico Maru, northwest of Menado, Celebes. 1944 - PBY aircraft sink Japanese sailing vessel, Toyokuni Maru, at the entrance to Ambon Bay. 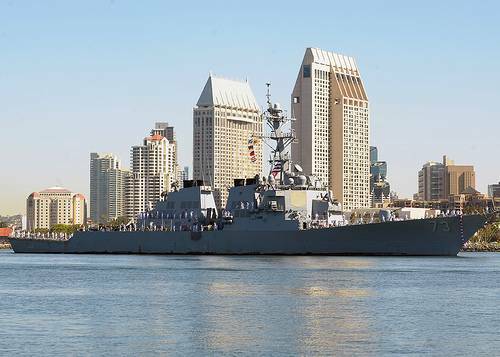 1998 - USS Decatur (DDG 73) is commissioned at Portland, Ore., before arriving at its homeport of Naval Station San Diego. The Arleigh Burke-class guided missile destroyer is the fifth U.S. Navy ship named for Commodore Stephen Decatur.